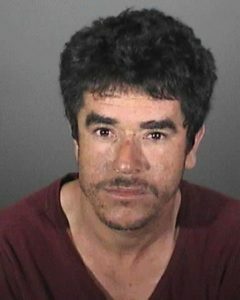 An oft-deported man accused of nearly killing his wife with a chainsaw in front of their three young children in Whittier and subsequently being involved in a hit-and-run crash pleaded not guilty Wednesday to seven felony counts. Alejandro Villegas Alvarez, 32, is charged with one count each of murder, aggravated mayhem, hit-and-run driving resulting in property damage and driving or taking a vehicle without consent, along with three counts of child abuse. The criminal complaint includes allegations that Alvarez personally used a chainsaw and personally inflicted great bodily injury upon his wife under circumstances involving domestic violence, according to the Los Angeles County District Attorney’s Office. Alvarez allegedly attacked his wife with a chainsaw in front of their three children July 11 in the 7700 block of Milton Avenue in Whittier, then fled in his wife’s vehicle, according to prosecutors. Two of the couple’s children, who are between the ages of 5 and 10, were reportedly covered in blood. Their mother subsequently underwent surgery. Alvarez allegedly then fled the area in his wife’s vehicle, struck another vehicle in Santa Fe Springs and fled the scene of that crash before taking another vehicle that was idling nearby, according to prosecutors. He was arrested a day later in Chula Vista by the San Diego County Sheriff’s Department. The Times reported that Alvarez was convicted on separate drug and drunk driving charges in 2013, and that ICE has requested that local authorities notify immigration officials before Alvarez is released to allow the federal agency to take him into custody. Alvarez — who is due back in a Norwalk courtroom Sept. 18 — could face a maximum potential life prison sentence if convicted as charged, according to the Los Angeles County District Attorney’s Office.